Check-in will begin at noon. We recommend checking in as early as possible prior to the 1:00pm boarding time as seating is not reserved. The Blues Collaborative will have a check-in table right next to the ticket booth for the Spirit of Philadelphia. You MUST check-in at the Blues Collaborative table to get your ticket for boarding. DO NOT go to the regular Spirit of Philadelphia ticket booth. MAKE SURE YOU GET A WRISTBAND. The wristband indicates to the crew that you are entitled to board the upper decks where the Blues Cruisin' Lunch is being held. You'll get your wristband when you check-in. This is new for 2018. Public parking is available is just off Lombard Circle as well as across Columbus Boulevard opposite the entrance to the Spirit of Philadelphia. Both public lots require you to pay in advance as you enter the lot. According to parking web sites, parking rates are in the range of $15-$20 per day depending on which lot you use. However, these rates occasionally change. DO NOT park in the lot in front of the Chart House Restaurant, which is private parking reserved for restaurant patrons. 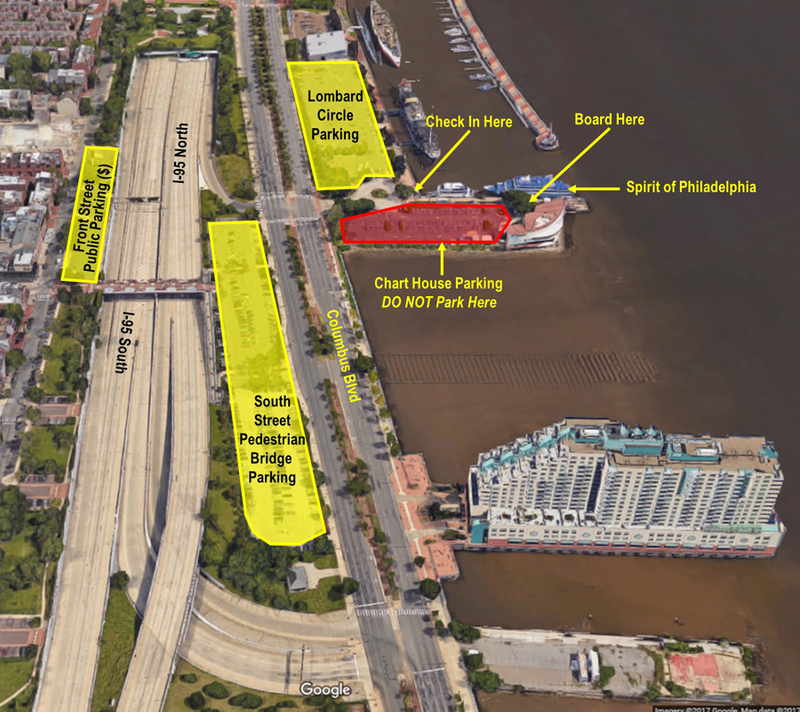 Click Here for additional information about directions and parking at Penn's Landing. After the Blues Cruisin' Lunch, a number of the performers will be joining the Blues Jam at the Twisted Tail at 5:00pm. If you're interested in listening (or jamming), the Twisted Tail is a short walk (less than 10 min) from the Spirit of Philadelphia dock. Use the Pedestrian Bridge to South Street, go one block to Second Street and take right. The Twisted Tail is just a few yards ahead on the right.